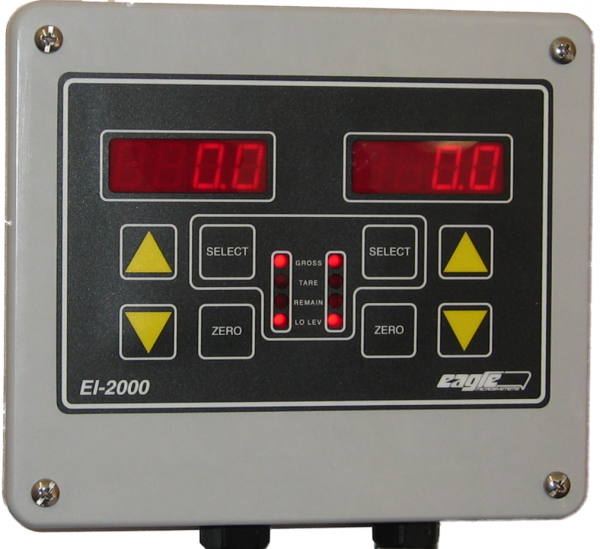 The Eagle Microsystems Eagle-Eye Digital Display Indicator/Transmitters are high precision, microprocessor-based indicator/transmitters for use with any Eagle electronic scale. These instruments are also compatible with most electronic scales of other manufacture. The family consists of the Model EI-1000 Single Channel and the Model EI-2000 Dual Channel Display units. Large, bright LED displays and highly accurate 4-20 mAdc outputs scalable to any required range characterize both instruments. Both displays and outputs are continuously available. The user-friendly keypad permits the indicator to display: Amount Used, Amount Remaining, Total Weight, Gross Weight, and Rate by Weight.